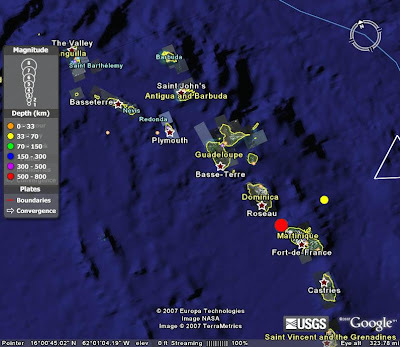 The tremors we felt on St. Kitts were estimated at about 4-5 on the Richter scale. The earthquake was so deep in the earth that it would not produce a tsunami. Early reports indicate that there was little or no damage on the islands nearest to the epicenter. Did you feel it too? M 7.4 !! 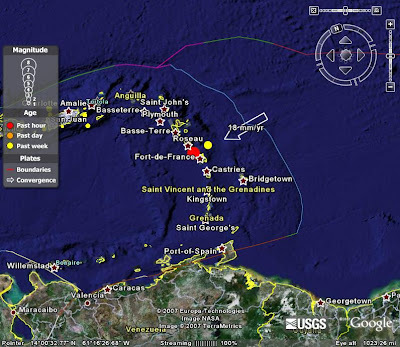 Earthquake felt over much of the Eastern Caribbean with the epicenter between Dominica and Martinique. Click for reports of strength and damage in our region. AllPsych Online is one of the largest and most comprehensive psychology websites on the Internet. Inside the site you'll find over 920 individual, cross referenced, web pages and an estimated 3000 pages of printed material. Originally developed by Dr. Chris Heffner while a graduate student in psychology, AllPsych is now referenced by over 100 colleges and universities in 10 countries and receives an average of 3,000 unique visitors and 10,000 page views per day. MELTING, standing for Multi-Ethnic Learning and Teaching in Nursing. A collaborative project initiated by the Mary Seacole Centre in the UK aimed at raising awareness of the multi-ethnic dimension of nursing, essential in today’s culturally diverse and rich society. The MELTING project, launched in 2004, is now a model for transcultural healthcare practice, suitable for nurses and midwives involved in learning disability, adult, child and mental health. It also includes sections on the epidemiology and politics of diversity, transcultural communication and healthcare practice, multi-agency, race equality management and clinical supervision. The Mary Seacole Centre works to promote the integration of a multi-ethnic philosophy into the process of nursing and midwifery recruitment, education, practice, management and research. The HIV/AIDS Parade will be held this Friday Nov 30th at 1-4pm. So anyone that could come out for awhile would be greatly appreciated. first aid, handing out water at the beginning and end of the parade, helping with registration and acutal students and faculty marching in the parade as a representation of IUON. If you are interested in volunteering please let me know by email!!!! Hope to see some of you there! Meet at the big tree by the cemetary at 12:45 pm for everyone to figure out what there positons will be. The MDG Monitor shows how countries are progressing in their efforts to achieve the Millennium Development Goals (MDGs) by 2015. In a recent survey of 6,000 physicians, 77-percent said they turned to the Web frequently to find medical information. If you're like them, then it's time to stop relying on the leading big-name, mass-market search engines and use the one designed especially for medical professionals: SearchMedica. Trying a SearchMedica query for yourself will show you the difference between a professional tool and one designed for consumers. Now try “hypertension“ with SearchMedica. We think you'll discover that SearchMedica delivers results that are credible, relevant, and easy to manage using our “results by category“ feature. If you agree, we invite you to begin using SearchMedica immediately. You don't need a password or login, and SearchMedica is absolutely free of charge. There is never a fee. Thank you for trying SearchMedica, and we hope you’ll tell your friends and colleagues about it. The American Academy of Nursing's Workforce Commission has identified ways that technology can make nursing practice more efficient and safe, based on case studies in 25 hospitals and health systems. The AHA’s American Organization of Nurse Executives subsidiary participated in the Technology Targets Project [click this link to watch the video], which was funded by the Robert Wood Johnson Foundation. The project identified more than 800 processes that could be improved to give nurses more time with patients and more than 1,200 potential technology solutions in the areas of medication management, communication, purchasing and patient identification. “The work represents significant insight into how we can leverage technology in the redesign of patient care delivery,” said AONE CEO Pamela Thompson. The study findings were released at a Nov. 7 news briefing in Washington.